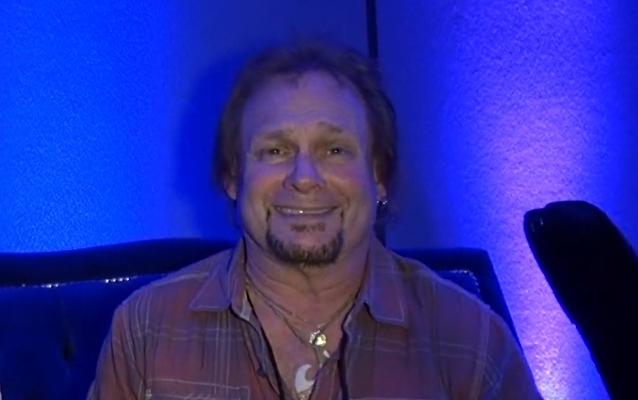 Michael Anthony has once again left the door open to a possible reunion with VAN HALEN. During an interview with Sally Steele of Vegas Rocks! magazine at last weekend's NAMM show in Anaheim, California, he said (see video below): "I'm always a 'never say never' guy. But at this point, I'm very happy with what I'm doing. I'm having a great time. And if something happens, it happens. If it doesn't, it doesn't, at this point." Anthony joined VAN HALEN in 1974 and appeared on the band's albums and tours through 2004, when he was removed from the lineup by Eddie Van Halen because he remained friendly with Sammy Hagar after the singer's second stint in the band. The bassist joined the group's ill-fated 2004 reunion trek with Hagar only after taking a pay cut and signing away his rights to any future use of the VAN HALEN name. When VAN HALEN reunited with original vocalist David Lee Roth in 2007, Anthony was replaced on bass by Eddie's then-16-year-old son Wolfgang. Asked by Steele if ever got the feeling back in the early 2000s that Wolfgang was being groomed for his spot in VAN HALEN, Anthony said: "No. Look what his dad does. You know that he was gonna be in the business somehow. And as far as him being groomed for my spot, I have no idea if that's what Eddie was thinking at any point or whatever." Michael also confirmed that he was never informed directly by anyone in the VAN HALEN camp that he was being replaced in the band. "I found out about it the same way you did, the same way everybody else did — through the press," he said. A recent rumor suggested that the original VAN HALEN lineup — including Anthony — will reunite in 2019 for a stadium tour. This would be the first time that the four founding members of the band, including Roth, Eddie Van Halen and drummer Alex Van Halen, perform together since 1984. But in a separate interview at NAMM, Anthony said that he "personally" hasn't been contacted by anyone in VAN HALEN about returning to the group. In recent years, Anthony has participated in a series of post-VAN HALEN collaborations with Hagar, including THE CIRCLE and CHICKENFOOT, which also reportedly irked the Van Halen brothers.